Dr. Thomas Swonke has a unique combination of skills that enables him to be a highly sought after clinician of patients from around the world. Dr. Swonke is trained in orthodontics , cosmetic and laser Dentistry which enables him to treat patients that other dentists find challenging. 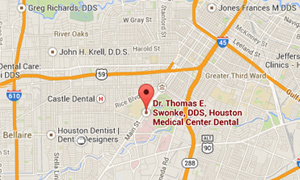 Dr. Swonke was one of the first dentist in Houston trained in neuromuscular occlusion . Dr.Swonke through the use of combining orthodontics and cosmetic restoration is able to provide a foundation that creates a beautiful smile that is healthy and stable. 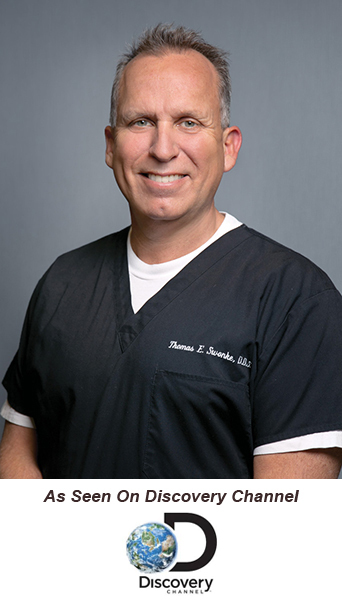 Dr. Swonke has been in practice for 28 years and treats patients from many countries including, Saudi Arabia, Kuwait, Mexico, Brazil, Columbia, Argentina, Oman, United Arab Emirates, Qatar, England, and Panama . He also is able to treat as well as consult with the best doctors in the world by being located in the prestigious Texas Medical Center. Dr. Swonke is involved in several research studies within the Texas Medical Center . 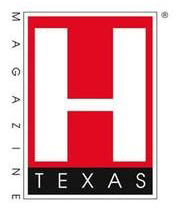 Houston Medical Center dental facility, which Dr. Swonke is the founder, offers the latest technology available in dentistry today. Dr. Swonke was featured on the Discovery Channel for his contributions to and pioneering concepts in clear aligner therapy through Clear Correct . Dr. Swonke and his team of dentists at Houston Medical Center Dental continue to provide cutting- edge care in a comfortable high -tech setting at the premier Memorial Herman Medical Plaza location. Married for 23 years to his wife, Mellonee. They have two children, Megan and Blake. Dr. Swonke is a dedicated marathon and half marathon runner. He enjoys biking and water sports with his children. Dr. Swonke and his wife Mellonee are involved with his church and have made multiple trips with The St. Laurence Medical Missions of Divine Mercy to the interior and borders of Mexico. There they have treated thousands of underserved patients with much needed dental care. Dr. Swonke resides in Sugar Land, Texas.